In the theory of development on both an individual and collective basis, the study of Systems and their variations is emergent. Uriel Bronfenbrenner has defined a very complex set of ecological relations that operate on the individual. It is my sincere hope that interested parties take his effort into serious consideration as well as other Systems Approaches. I sincerely hope that I have done the best to portray his work. The Ecological Systems Approach shares with Systems the division into two territorials. Traditionally this has been taught sociologically as primary and secondary institutions. In PI the individual occurs first as a natural unit. The family follows. If taken from the Systems Approach such deals with parenting. This involves learning. One's biological parents are considered the primary parents. Secondary Institutions, SI occurs at school, religion, and finally with government. If learning occurs from another individual as a cleric, schoolteacher, coach, or even another sibling then such is designated secondary parenting. Bronfenbrenner pertains to the Sociocultural View of Development. He has been influenced by the school of Social Development Theory. A major thinker that he has sourced is L.S. Vygotsky. The major theme of his framework is that social interaction plays a major role in cognition. Every function in the child's cultural development appears twice: first, on the social level, and later, on the individual level; first between people (interpsychological) and then inside the child (intrapsychological) (Vygotsky L.S. 1962, 1968). Bronfenbrenner's orientation incorporates the following Developmental Issues. He does not believe that we are born with negative nor positive tendencies. We are actively involved in selfdevelopment and the environment. The individual and the environment are in a state of flux. Nature and nurture are both incorporated. Qualitative and quantitative change will occur. In generalization, development is not universal. All developmental issues must be studied within social contexts. Bronfenbrenner stresses a phenomenological experiential outlook which is personal and an individual perspective. All the factors occur within dynamic contexts as social, historical, and cultural dimensions. The word ecology is derived from the Greek ecos. An ecology in biological terms is a system of interacting organisms. 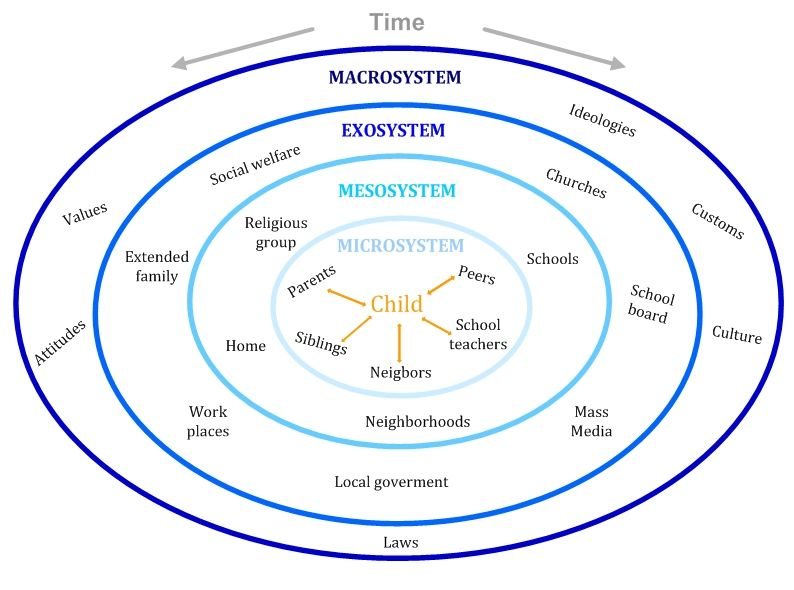 In extension from Systems, Bronfenbrenner has postulated four ecologies. They are the microsystem, mesosystem, exosystem, and macrosystem. The microsystem surrounds the individual's immediate environment and includes the family, home, neighborhood, and work. The mesosystem incorporates connections and dimensions with objects in the microsystem. The exosystem contains those territorials that do not contain the individual as school, parents workplace, and mass media. The latter is a nonplace group in Systems. One may not physically go to such a location. The macrosystem contains values, customs, laws, beliefs, and the resources of a culture or society. A fifth level exists outside the system. It is the chronosystem. Such is time related. Changes in life events can be imposed externally or by the individual. Persons and their environments form a network of interdependent effects. (Berk, L.E. 2000). The thinking of Bronfenbrenner's nexus with Systems is to it's advantage. Systems exist as a degreed specialization within itself. A model without a social system is not considered advanced. In contrast, one may criticize such as an attempt at utopic states. Such discovery or designs are limited by the skill of it's author or researcher. The Ecological Systems Approach is unique in that it attempts to define the individual and ones relationship with the environment. Different contexts that are in a flux or a texture are considered as well. To date most collaborating research has been on the family and the child. Such is contained within the microsystem. One of the primary focuses of this approach is the learning of the child. Both dyadic and triadic parenting are inclusive. The former pertains to the mother child relationship and the latter pertains to the first plus the inclusion of a sibling. Bronfenbrenner has delineated Five Critical Processes for Positive Development. Proposition 1. In order for the child to develop intellectually, emotionally, socially, and morally a child must participate in progressive reciprocal activity on regular basis over ones life. This activity is with an individual who shares with the child a strong mutual emotional attachment. Proposition 2. The establishment of patterns of progressive interpersonal interaction under conditions of strong mutual attachment enhances the child's responsiveness to the immediate physical, social, and later symbolic environment. Proposition 3. The establishment and maintenance of patterns of progressively more complex interaction and emotional attachment between caregiver and child depend in substantial degree on the availability and involvement of another adult, a third party who assists, encourages, spells off, gives status to, and expresses admiration and affection for the person caring for and engaging in joint activity with the child. Proposition 4. The effective functioning of childrearing processes in the family and more distant settings requires the ongoing patterns of exchange of information, two way communication, mutual accommodation, and trust. Proposition 5. The effective functioning of childrearing processes in the family and other settings requires support from public policies. All occupations and members of the society must support cultural practices that provide time, space, stability, and customs in childrearing. (Bronfenbrenner, U. 1990). 1. Microsystem: This model contains the individual at the center of the microsystem. Those objects and persons in the immediate setting in which one lives as family, peers, school, and neighborhood are prominent. These are the most direct interaction with agents. The individual is not passive in this context. One helps create the constructs in the microsystem. What is essential in this concept is relationship. Events must have a substantial amount of contact over time to qualify as this subsystem. Bronfenbrenner uses the term bidirectional to describe interactions between the child and parents, teachers, and others who interact upon one another in the same level of his model as well as those on layers on either side of the focal system or that component being analyzed. Bronfenbrenner stresses to understand development one must keep in mind that relationships are bidirectional. Parenting affects the child, but this individuals biological and socially influenced characteristics have an effect on the behavior of adults. As infants, the systems most likely to affect the individual are parents, siblings, and caretakers. (Boemmel, J. & Briscoe, J. 2001). An important perspective in General Systems Approaches is that the child must be motile to increase territoriality by some mechanism to develop the range of the social environment that will come to socialize and shape one. The assumption here is of a normal healthy person but the input of a disadvantaged individual would only result in a different input and therefore a different output that aids in development. Erik Eriksson's Psychosocial Theory of epigentic personality is frequently mentioned in Lifespan and Development thinking with Ecological Systems Approaches. Such covers eight stages of maturation encompassing social dimensions imposed over the social environment itself. Schematica is the plural of schemes in Erickson's thinking. 2. Mesosystem: This subsystem explains the interrelations among major settings containing the developing individual at a particular point in one's life. This includes the relationship between different microsystems, family, group, and peers. When communication is poor between various microsystems, at risk individuals are more likely to not orient themselves in society if there is a breakdown between microsystems. The mesosystem is a system of microsystems. In General Systems Approaches, language is the first territorial community. Bronfenbrenner and his followers appear to be more focused on the communicative aspect in the microsystem between adult and developing person. All Systems need to communicate information internally and externally to maintain equilibrium or such may become isolated and disintegrate. 3. Exosystem: This territory includes specific social structures and organizations that do not contain the individual but affect the immediate environment of one, thereby influencing and possibly determining outcomes are considered in this ecology. These structures include major institutions as they operate on the local level as neighborhood, workplace, and governmental agencies. There are communities that have organizations for developing youths for their social and psychological support. Examples of exosystemic risk factors are the parents work environment may have a negative impact on a child's microsystem. A lack of funding may have a negative impact on the classroom. Conversely improvements by educational planning may have a positive effect on at risk youths. 4. Macrosystem: Describes the culture in which individuals live. Cultural contexts include developing and industrialized countries, socioeconomic status, poverty, and ethnicity. 5. Chronosystem: Is the time related change outside of the System itself. It includes the patterning of environmental events and transitions over life. Socio historical conditions are inclusive. Toffler and Toffler have done research in this area. In Major Social Trends such describe various time related change on the previous ecologies. The theme is movement away from the Agricultural Industrial age to the Information Age. These three civilizations symbolized by the tools of production as the hoe, the assembly line, and finally the computers are substituting one another in space and time. De massified production of highly customized products are leading to a complexity in the economy and displacing labor. Also characteristic of the present is the globalization of the economy challenging national sovereignty and the re emergence of the family. The historical time line has witnessed the prominence of the extended family, to the nuclear family, to the atomized family where only one parent is present in the home. (Toffler & Toffler, 1994). A small hypothetical scenario will follow demonstrating aspects of the Ecological Systems Approach. In the microsystem two twenty five year old persons, male and female choose to take Planned Parenting courses and natural childbirth to procreate. A male child is born and the family lives in a two bedroom house in the suburbs. The child grows and attends public schools. The husband is a teacher and the mother works part time as a bookkeeper. In the mesosystem the child links his interest in sports that he has developed with family and friend to school teams. His school work is also linked to the family's church. The wife's employer is active in supporting both the school and religious activities in the community. The exosystem defines settings that do not immediately have an active role on the person. The father must spend an inordinate amount of time at work. He is underpaid for his ability. The mother turns to fulltime work. The government is running a deficit and is slashing programs. Conversely libraries and parks will not be cut, but not expand. The macrosystem closely resembles major institutions. The family lives in a Judeo Christian work ethic family. The country is a democracy and ethnically diverse. There is a proliferation of mass media, entertainment, and sports expansion. The Chronosystem is time related. It is the patterning of environmental events and transitions over the life course, as well as socio historical circumstances. For example, divorces is one transition. Researchers have found that the negative effects of divorce on children often peak in the first year after the divorce. By two years after the divorce, family interaction is less chaotic and more stable. As an example of socio historical circumstances, consider how the opportunities for women to pursue a career have increased during the last thirty years (Santrock, John W. (2007). The Ecological Systems Approach is unique in it's division of four ecologies. The model has many distinct advantages in it's favor as well as it's weak points. Traditional Systems Approaches tend to stress the development of institutions as components of a sustaining culture, society, and government. Such is also more concrete in their boundaries by mapping out physical objects. Usually a social dimension approach is then applied to account for relations between individuals and one another and other objects in their environment. In Traditional Systems, Secondary Institutions usually begins at the teacher and classroom, easy to see for all. Religion is the next territorial not so easy to see, but the structures as churches are. The outermost level would be government. Hence it assumes a more modern approach that one will live in a state where the government has more Social Control than religion. The mapping out of these components is more objective. Erickson's theory is an individual identity psychosocial based model. His dimensions of man link the socialization of object relations in the environment. This later could be applied to collective identity. This is important to the socialization creates the individual thinkers. This area is very subjective from both sides and an area to attack either model. What is unique is that Bronfenbrenner includes both in his ecologies without a separation from my analysis. This is an interesting combination of not separating the object and the relationship with the object in a collective setting. Herein is a weakness. If such does indeed exist objectively to all it will tend to be perceived subjectively by not only laypersons but also researchers. It's uniqueness is it's complexity, which prevents such from being researched independently. The Ecological Systems Approach has many uses, however almost all data collected pertained to Lifespan and Development. Bronfenbrenner was a co founder of Head Start. His model is heavily focused on the positive development of the child and family. His work has readily aided the at risk child through the above program. He is a strong advocate of active government involvement in childrearing. His approach also has followers who are positing variations and research is ongoing at the university level. My personal perspective is that in the next 100 years all theories will be incorporated in a System based approach. A Topical Approach to Life-Span Development. Santrock, John W. (2007). New York, NY: McGraw-Hill.